The following are The Green House® Project answers to some of the frequently asked questions about the Green House model of care. The Green House Project is a radically new, national model for skilled nursing care that returns control, dignity and a sense of well-being to elders, their families and direct care staff. In the Green House model, residents receive care in small, self-contained homes organized to deliver individualized care, meaningful relationships, and better direct care jobs through self-managed team of direct care staff working in cross-trained roles. Green House homes meet all state and federal regulatory and reimbursement criteria for skilled nursing facilities. Recent research shows that Green House homes significantly improve quality of life and care, create better direct care jobs, cost the same or less to operate than traditional nursing homes, and save the healthcare system costs associated with avoidable hospitalizations and pressure ulcers. Because language holds great power, in The Green House model, words are used in a very intentional way. Titles, for example, are different than in traditional long term care, to make it clear that we are not creating small nursing homes, but rather a radical transformation. The Shahbaz (plural form is Shahbazim) is a versatile worker who provides a wide range of assistance, including personal care; activities; meal planning, preparation, and service; and laundry care for seven to ten elders. The Shahbazim also perform light housekeeping duties. The Guide serves as coach and supervisor to the Shahbazim, and is responsible for the overall operations and quality of services in the home. The Guide may be responsible for one or more Green House homes, depending on the size of the community. The Sage is a local elder who acts as a coach or mentor, facilitates the development and continued growth of the self-managed work team of Shahbazim and serves as their trusted advisor. This is a volunteer position. How does the staffing in a Green House home compare to a traditional nursing home? Under The Green House model, some positions may be eliminated or reduced, with funds typically shifted away from some administrative and ancillary departments toward the elders’ direct care. The Clinical Support Team, which includes nurses, therapists, social services, activities, and dietary professionals, works in partnership with the Shahbazim to develop and implement individualized care plans for the elders. 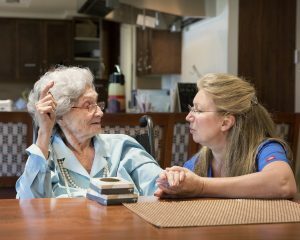 A Guide (a new role typically assumed by a nursing home administrator) serves as coach and supervisor to the Shahbazim or direct care workers, and is responsible for the overall operations and quality of services in the home. A self-managed work team structure is used, with the Shahbazim coached by and accountable to the Guide. The nurse also plays an important role in building an empowered care team within The Green House home, bringing all of his or her knowledge and skills to the Shahbazim and elders as partners and team members. The nurse also is seen as a teacher and mentor to the Shahbazim. What does it cost to live in a Green House home? Medicaid, private pay and limited Medicare, may cover the elder’s care. The cost per elder per day depends on the cost structure in your area. Green House homes that are licensed as traditional nursing homes are eligible for Medicaid and Medicare reimbursements along the same lines as a traditional nursing home. If licensed as assisted living, Medicaid reimbursement depends on the state’s assisted living provisions. Medicaid: The costs are equivalent to the traditional Medicaid costs for nursing homes. If the income level is above the Medicaid minimum, there may be a co-pay. Private Pay: Each facility determines its own private pay cost structure based on their local market. How do you ensure clinical excellence within The Green House model? A Clinical Support Team, comprised of a Medical Director, Director of Nursing, nurses, therapists, social workers, dietician, and activities coordinator, will provide skilled care for the residents as required in the care plan. The Shahbazim, by developing close relationships with the elders, will provide the Clinical Support Team with valuable information to assist in the development of the care plan. Typically, one nurse will support two to three Green House homes (20-30 elders) depending on the elders’ needs and the time of day. Licensed nurses are available and responsible for clinical care in Green House homes on a 24-hour basis. At any time, if a nurse is not in a home and is needed, he or she is available to the Shahbazim and elders via an emergency pager and other communications technologies. Do all Green House homes look the same? There are elements of a Green House home that are common throughout the model to achieve desired outcomes, but the homes will look different in each community: single family homes in the suburbs, apartments in urban areas. Architects should design a home that fits into the surrounding community and that is similar to housing in which an elder would have lived, but retains the core elements of The Green House model: 10-person home, private bath and bedroom for each elder with locked medicine cabinet, hearth area with open living room, dining room and kitchen, dining table that seats all elders and caregivers, ceiling lifts, fenced outdoor space, and lots of windows. Sizes range from 6,400 – 7,000 square feet. What Research has been conducted to date? •Significantly improved quality of life for elders, particularly regarding privacy, dignity, autonomy, relationships and overall well-being. 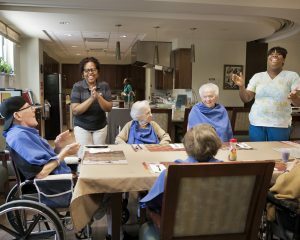 •Each day, direct care staff spent more meaningful time with elders without increasing overall staff time. •Higher levels of satisfaction are reported by family members and staff. The Green House model also has big benefits for staff; they report that they feel more empowered to assist residents and experience greater intrinsic and extrinsic job satisfaction and less stress compared to staff in traditional nursing homes. These men and women are also more likely to say they plan to remain in their jobs.